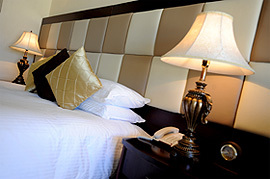 The Classic Family Rooms feature one king sized bed and can also accommodate two rollaway beds. These spacious rooms have a bay window (Approx size: 60sqm). They overlook the bastions. Working desk, sofa, individually controlled air-condition/heating, international satellite flat screen TV, 1 direct dial telephone, 1 bathroom phone, safe, mini bar, coffee and tea making facilities, spacious bathroom with a deep soaking tub, shower and large washbasin, WC. Should you wish to book a Classic Room or Classic Family Room at this Luxury Malta Hotel check availability for your holiday dates.